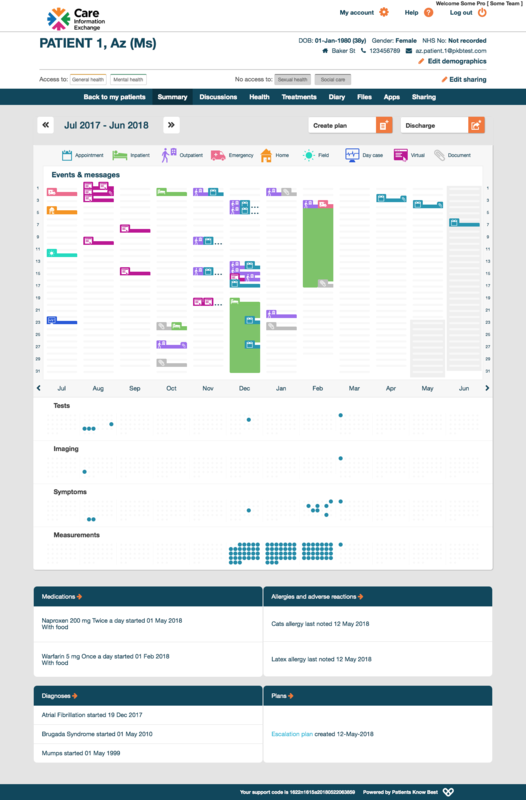 We are about to release the first version of the timeline view. More versions will follow over the next few weeks. The timeline’s purpose is to show a clear visual representation of activity in the patient’s record, so that a clinician looking at it for the first time can get an idea of the patient’s health activity. More significantly, beneath the user interface is a more scalable rewrite of our encryption layer, consent rules and developer APIs. 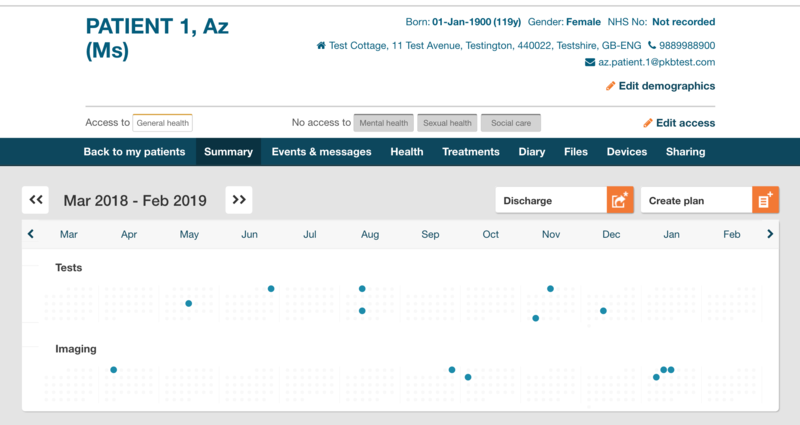 We have been working on migrating our REST APIs to FHIR and PKB’s timeline view is using these FHIR APIs to show the record in PKB’s user interface. Our first release includes the Tests and Imaging swim lanes. Each swim lane shows the user which days have data. Clicking on any of these swim lanes will take the user to the detailed page for that section. These swim lanes are displayed on the summary page as it is the first page the professional lands on when entering the patient’s record. Following this release, we will introduce swim lanes for Events & messages, Measurements and Symptoms. Clicking in the Events & messages swim lane shows further details of events on that day such as the event name, location and source details. We will also be reworking the existing tables on the summary page to improve the display of data such as medications, allergies and diagnoses. We will be removing the demographics table as this information is now displayed in the new patient banner (released last October) and the Investigations & results section as this will be displayed in the swimlanes. Please contact us if you if have any feedback or questions about the timeline.